The Greek mythological slugfest from visionary filmmaker Tarsem Singh ('The Cell,' 'The Fall') is coming to Blu-ray and Blu-ray 3D in March. 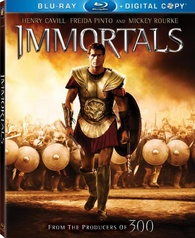 As previously reported, Twentieth Century Fox Home Entertainment has working on 'Immortals' and 'Immortals - 3D' and now both titles look to be heading to stores on March 6. From the producers of '300,' Mark Canton, Gianni Nunnari, and Relativity’s CEO Ryan Kavanaugh, 'Immortals' explodes off the screen with action-packed battles, mythological adventure and an all-star cast including: Henry Cavill ('Superman: Man of Steel'), Luke Evans ('Robin Hood'), Kellan Lutz ('Twilight'), Isabel Lucas ('Transformers: Revenge of the Fallen'), Freida Pinto ('Slumdog Millionaire'), Stephen Dorff ('Public Enemies'), John Hurt ('Hellboy') and Mickey Rourke ('Iron Man 2'). In this epic tale of vengeance and destiny, power-mad King Hyperion (Rourke) threatens to destroy all of humanity on his maniacal quest to obtain the ultimate weapon – the legendary Epirus Bow that gives the power to unleash war on both Heaven and Earth. But Theseus (Cavill), a heroic young villager chosen by the gods, rises up to stop Hyperion’s brutal rampage. With supernatural help from the beautiful oracle Phaedra (Pinto), Theseus embraces his destiny and leads a fierce band of warriors in a desperate fight for the future of mankind. Specs have yet to be revealed, but supplements include deleted scenes and It’s No Myth. Blu-ray exclusive supplements include Alternate Opening – Young Theseus, Two Alternate Endings - This Is Our Last Embrace & Theseus Kills Hyperion, Caravaggio Meets Fight Club: Tarsem’s Vision, and Immortals: Gods & Heroes (Graphic Novel). Suggested list price for the Blu-ray is set at $39.99 and the Blu-ray 3D is $49.99. You can find the latest specs for 'Immortals' and 'Immortals - 3D' linked from our Blu-ray Release Schedule, where they're indexed under March 6.